Modern camouflage was invented by artists who studied nature, and camouflage in turn influenced some of modernism’s biggest breakthroughs. Camouflage—the words is French but the invention turns out to be American. We’re accustomed to the idea that French artists made the great discoveries and movements of modern art: Impressionism, Pointillism, Fauvism, Cubism and so forth. But this is an interesting case in which the chain of influence worked in reverse, in which an eccentric American academic painter reshaped how we think about the world—and very likely even influenced the great Picasso. The eccentric was Abbott Handerson Thayer, one of those idealistic painters of beautiful women patronized by the railroad magnate and collector Charles Lang Freer. In addition, the Boston-born Thayer had been fascinated by birds since childhood. The earliest surviving photograph of him, taken when he was about 10, shows him with an owl sitting on his shoulder; in fact, by the time he was a teenager, if he spotted a feather on the ground he could identify the species from which it came. After going through art study in Paris and mastering the techniques of the academic figure painters of the day, Thayer settled in New Hampshire. There he adopted a schedule of painting furiously early in the day and then relaxing in the late afternoon by going on nature walks and observing birds. Over time, he became convinced that the patterns in the plumage of birds and the fur of animals served their survival by enabling them to hide from predators. 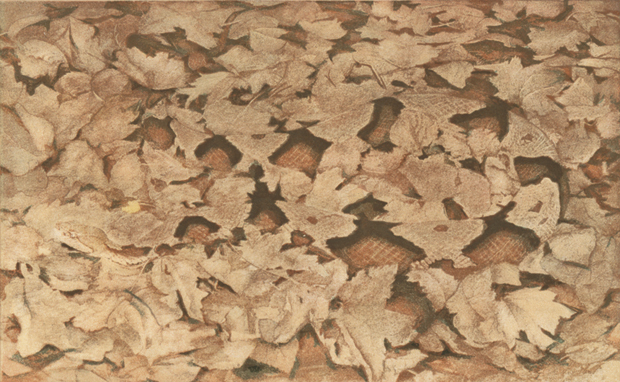 Inevitably, his study of camouflage principles drew directly on his skills as a painter. Being both naturalist and artist, he trained himself to observe the way that the edge of a form stands apart from or dissolves into its surround. Using these skills, he reduced camouflage to three basic principles that he unveiled to the world in a book on the subject, Concealing Coloration in the Animal Kingdom, co-authored with his son Gerald and published in 1909. In crude form, of course, camouflage has been used in warfare since ancient times—the use of branches from Birnam Wood to conceal an advancing army, as described in Shakespeare’s Macbeth, is just one of innumerable examples. But Thayer was the first to study camouflage in a systematic way and to lay out its fundamental principles. What’s more, he illustrated his text with stunning paintings of birds and other animals disappearing against backgrounds representing their natural habitats—including a group of bizarre and remarkable creations, similar to modernist collage, which blended photographs and paintings with bird feathers and other materials to demonstrate that the coloration on the bodies of birds and animals was akin to painting. The first and most obvious of Thayer’s principles is that the color of a camouflaged object should match its background. But if this is the only principle applied, an object is still easy to identify from its silhouette. Thayer went on to identify two even more significant principles, the first of which, called disruptive patterning, is somewhat counter-intuitive. Remarkably, strong patterns provide better camouflage than delicate ones, since they disrupt how we read the outline of a form. Thayer’s third principle is called counter-shading. We’re accustomed to a world in which objects are lighted from above, by the sky, and therefore we assume that objects will be lighter at the top and darker underneath. Therefore a dark stripe at the top of an object and a white splash underneath disrupt our expectations of how an object will appear. In fact, counter-shading by itself is a surprisingly effective form of camouflage, even if the other two principles are not applied. Why does the coloration of birds vary so much? One of Thayer’s most interesting observations is that birds vary in coloration according to the context in which they are seen. Birds that live low to the ground, such as whippoorwills, are colored in a way that matches with ground cover and leaves. Those that are seen against the sky, such as blue jays, pick up sky color and depend less on concealment and more on disruptive patterning. What of birds such as quail that are generally seen against a background that is 50 or 100 feet behind them? Thayer showed, convincingly, that their camouflage is designed as if they were transparent. The patterning of their feathers matches with that of foliage in the distance. Thayer’s ideas were quickly put to both military and artistic use. He himself recognized the potential use of his ideas for military purposes, and a group of young artists around him, including his son Gerald and his neighbor Jerome Brush, began to experiment with different modes of patterning that could be applied to boats, uniforms and military installations to make them disappear from a distance. These efforts eventually resulted in a “Camouflage Corps” being created for the U.S. Army, led by Homer St. Gaudens, the son of the famous American sculptor. When America entered World War I, a number of notable American painters became involved in one way or another in camouflage work, including Thomas Hart Benton and Charles Burchfield. Interestingly, there’s a good deal of variety to the patterns they produced, ranging from curvy blob-like shapes to angular stripes. Initially many of the artists seem to have attempted to “represent” nature, but as they developed more experience they discovered that bold abstract patterns worked equally well. Intriguingly, even before the American unit was formed, the French became involved in camouflage due to the efforts of a rather conventional 43-year-old painter, who otherwise left no mark on the history of art, Lucien Victor Guirand de Scevola. While his own work was academic, de Scevola had seen paintings by the Cubists that virtually eliminated the distinction between an object and its background, and it occurred to him that these techniques could be put to military use. He explicitly stated, “In an effort to obliterate objects, I used the techniques the Cubists had used.” Indeed, de Scevola seems to have hired a number of noted modernist artists in the belief that their skills would be particularly well suited to camouflage purposes. Between 1914 and 1917 de Scevola’s staff grew from six to 3,000, including a number of modernist artists of reasonable distinction, such as Jacques Villon, André Dunoyer de Segonzac, Charles Camoin and Charles Dufresne. The bold abstract patterns employed by these artists resembled zebra stripes, so their work was often described as zébrage. Because the French army became so heavily involved in these activities, we now use the French word camouflage, which was originally used to refer to a smoke bomb that obscures one’s vision of what’s behind it. But perhaps the most fascinating masterworks of camouflage produced during the war were those created by the British navy, under the guidance of the illustrator and designer Norman Wilkinson. Wilkinson recognized that it was all but impossible to make ships disappear from sight because their forms stand out against the flat surface of the water. But a dazzling pattern of camouflage could effectively disrupt perceptions of a ship’s size, speed and distance. Sadly, the wonderful dazzle-painted ships created in this period were long ago scrapped, but Edward Wadsworth, an English painter associated with the Vorticists, made a marvelous painting, Dazzle Ships in Drydock, that captures their amazing appearance. With a few exceptions—such as Roy Behrens, a professor at the University of Northern Iowa whose book False Colors (Bobolink Books, 2002) provides a brilliant overview of the subject—art historians have hardly discussed camouflage. Thayer stood very much on the periphery of modern art, and a phenomenon like camouflage doesn’t fit with the usual notions of an artistic movement. Yet there’s a good argument to be made that camouflage pushed art in new directions. Take Picasso, for example. In The Autobiography of Alice B. Toklas, Gertrude Stein recalled an evening early in 1915 when she and Toklas were strolling down a street in Paris, accompanied by Picasso and his mistress Eva Gouel. “All of a sudden down the street came some big cannon, the first any of us had seen painted, that is, camouflaged. Pablo stopped, he was spell-bound. C’est nous qui avons fait ça, he said, it is we that have created that.” If one looks through his oeuvre, 1915 seems to mark a point at which his work shifted from the delicate tones and gradations of early Cubism to bolder, more stripy patterns, like those used to camouflage ships and cannon during World War I. Is it inappropriate to point out that his great mural of the 1930s, Guernica, with its bold patterns and monochrome palette, resembles camouflage? But the most profound impact of Thayer’s ideas seems to have occurred even earlier. An intriguing aspect of his theory of camouflage is the notion that “resemblance” can be achieved not through literal representation but through abstract principles. For animal camouflage does not directly represent a particular scene in the way that it would be captured with point-for-point accuracy by a camera. Instead it reduces the characteristics of an environment to abstract shapes which mimic essential characteristics. Just a year after Thayer’s book appeared, early in the summer of 1910, a young painter in Westport, Conn., Arthur Dove, marked a new pathway in art—he produced a group of small abstractions which slightly precede the first abstractions of Kandinsky. While occasionally one can pick out a shape that looks like a house or a branch or some other familiar thing, they don’t resolve into fully recognizable images, but look more like bird’s feathers or animal skins, with flowing stripes and blobs and an occasional shimmer of color. Dove never publicly exhibited this first series, but over the course of the next year or two he created another series of abstractions (including Nature Symbolized No. 2), which Alfred Stieglitz displayed at his gallery and christened “The Ten Commandments.” Larger and more confident in design than the first group, these have long been recognized as among the most adventurous, innovative works every created by an American artist. This is a little mystifying, though it suggests that Dove was searching for some sort of archetypal color quality that would enable us to identify an object in an abstract way. What he said next is a little more helpful. “To understand clearly, go to nature or to the Museum of Natural History and see the butterflies. Each has its own orange, blue, black, white, yellow, brown, green and black, all carefully chosen to fit the character of the life going on in that individual entity.” In other words, for Dove, as for Thayer, butterflies’ wings were essentially abstract paintings. The task of the artist was to absorb their principles and apply them to the act of creation. Of course, such a merger between the artist and nature’s principles was perfectly in the spirit of Thayer’s approach, as a little anecdote suggests. When he was tired from a day of painting, Thayer would wander up the slopes of Mount Monadnock and sit on its slopes near the summit while the dusk settled. As the owls woke from their slumber and swooped out of the forest in search of prey, Thayer made a sound that attracted them. They would come and land on his shoulder and even on his head. In a sort of personal act of camouflage, he had immersed himself in nature’s principles so deeply that he blended into it. The owls believed that he was one of them.